With this low priced memory foam solution from Resort Sleep, buyers will get a good taste of a low priced memory foam mattress that has that just right feel. The ecofriendly product uses all 10 inches of the foam to show users that sleep can be comfortable on even the lowest priced mattress if the materials are made correctly. In an interesting twist the company decided to throw in a free memory foam pillow, which although nice, would have been better in a set. Coming with 1 free memory foam pillow means it was thrown in as an afterthought, most likely to get rid of inventory. The quality of the foam itself is very basic, even with the open cell technology that helps with making consumers feel like they are sleeping in an oven. There are no killer features with this product to speak of other than the great price and the long 20 year warranty that comes included with it. Resort Mattress is 100% made in the USA and CertiPUR certified, so is a nice option for users that don’t want to go all in on a fancy memory foam mattress. The interesting thing about Resort Sleep is that they are not really a known brand at all, and it’s safe to say they are a new company. The strictly online company does most of its selling on sites like Amazon, so it is a little curious that they offer a 20 year warranty on their products, when more than likely that exceeds the current history of the company. There are some rumors that the company is just a small operation that bought up a lot of liquidated memory foam mattresses from another company and is now trying to get rid of stock. The rumor gets close to reality when browsing their website for products, and the only option being this particular bed in the different sizes. So it’s safe to say that Resort Sleep is not the maker of this mattress, and no one knows who the actual maker is. There is also no phone number or address to contact the company with, just an email form on their website. To their credit, they have a very clean interface that is easy to navigate and see on all computer screen sizes. They also have one of the best faq’s available for smaller and larger companies. Other negatives are limited testimonials on the website, and the complete lack of an About Us page. For customers wary of the company, follow your gut, especially with the 20 year warranty they are offering on their product. The mattress feels quite good actually. The claims of open cell memory foam and providing better contouring and breathability are valid, and works well despite it being of medium firmness. It has the ability to hug the consumer but still give them enough control so that they are not engulfed by foam. And on hotter nights it manages the heat fairly well, although in many instances it can be better. A just right rating to the firmness of the mattress is correct, and it is thick enough at 10 inches to really hit the sore areas. Of those 10 inches 3 are dedicated to the top portion as a premium memory foam top while the other 7 work as a high density support core. The upgraded memory foam pillow that comes with it is sort of a throwaway pillow, and doesn’t match the comfort or firmness level of the memory foam mattress. It is valued at $40, so it would make a good gift to someone else if possible. Sizes available are twin xl, full, queen, king and California king. It’s strange there aren’t any regular twins available, but that is more a stock issue. Queen dimensions are 80x60x10 and weight is a nice light 64 pounds total. The pillow is listed as a large sized pillow, but keep in mind it has a completely different feel than the mattress and doesn’t blend as advertised. Best choice makes your night sleep peaceful and healthy. There are few to list, but the 10 inches of foam on this mattress do a good job of providing support to the body while also contouring correctly when needed. And with a memory foam so thick and lacking premium cooling solutions, the open cell memory technology does a good job while sleeping and keeping body heat away from the user as they sleep. This is another in a short line of memory foam options that provides a good firm mattress, but it is more of a just right feel than anything. Buyers won’t be turned away by a too firm mattress nor by it being too soft. If anything this is the perfect guest room memory foam for customers that don’t want to purchase high quality solutions for their guest bedrooms. The only fair comparison to make with this mattress is to the earlier versions of memory foam mattresses that came out. This is a slight improvement on them that offers mattress breathability options, with no extra gimmicks and no real draw other than the medium firmness. It’s a plain first generation memory foam copycat with some upgraded features, but nothing that really sets it apart from the other earlier models in the industry. Buying a mattress with a 20 year warranty from a company with no major investment in the industry is not really a good idea. If the product offerings were more diverse, or better yet if the company had better word of mouth, it would make sense. As it looks, this is just a bunch of rebranded beds that never got sold and were bought up by a small company to sell for a quick profit. Because of the low price, it still works great as a second option in a household with several bedrooms, but don’t depend too much on the included warranty if you decide to purchase. The priority should be the relaxing sleep whole night. Because of the nature of the product, the price of it is as volatile as the stock market. It frequently goes up and down depending on who is selling it. A smart thing to do as a consumer would be to pick up 2-3 of these if you need them if the price drops just low enough. They make excellent mattresses as long as it isn’t in the master bedroom. The stock is plentiful, but keep in mind that certain sizes are not available and others are limited. When deals like this get passed along to the customer, it can be a hit or miss. In this case it is right down the middle, and will either be beneficial to you as a buyer or just average. 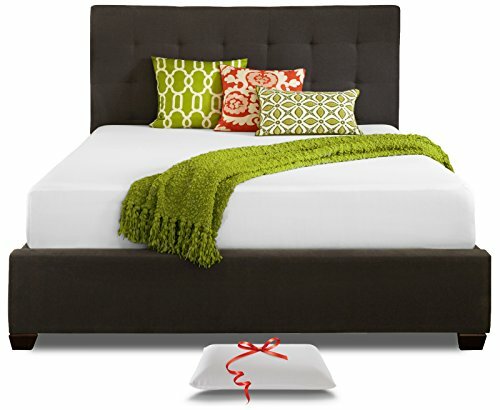 Buying a couple of these when the price is low would be a smart move, since they are really decent memory foam beds for the other bedrooms in your house. There are better solutions out there, but none that will dip as low in price as this, and offer that just right feel. Take the plunge if the price is just right, and it won’t be so bad of a deal.